Entrepreneurship is not just about starting businesses. Getting out on the other side, ideally richer than before, is just as important. Unless you’re one of the lucky few who start and take a company public in an IPO, the other option for a successful “exit” from that business is to sell it. This exit opportunity is especially important for startups that raise venture capital. VC’s are duty-bound to return capital back to their investors, and hopefully with more than they started with. However, the market for startup equity isn’t very liquid. Unlike the public stock market, where investors can liquidate their positions in a fraction of a second, VCs usually have to wait years for a liquidity event. How that process works – the actual deal-making and negotiating – is a bit beyond the scope of what we can do today, but here we’re going to take a look at how the money shakes out of a company. 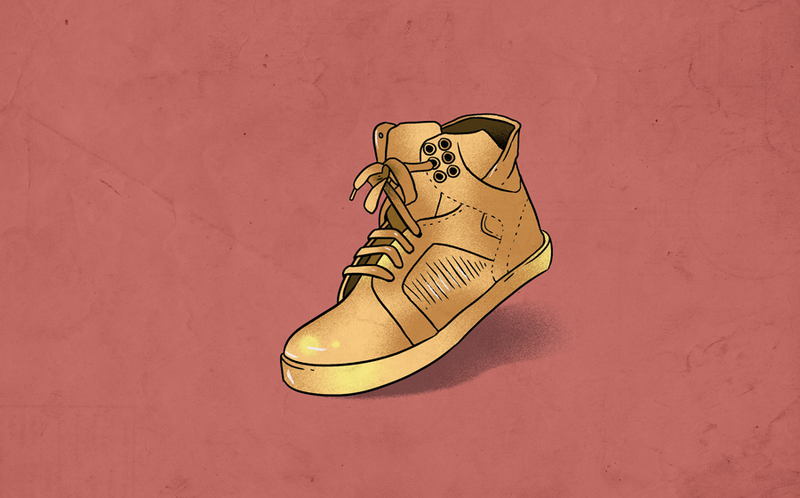 This is the fourth and final installment in a series called A Startup Takes Flight. 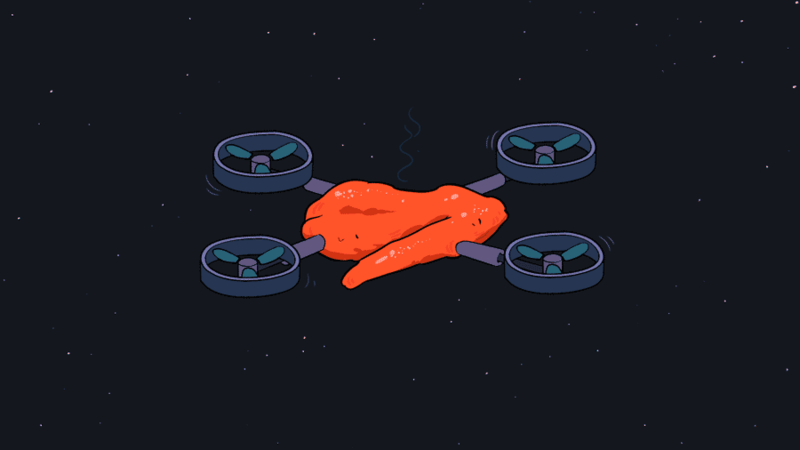 We started by making up a company – the Internet of Wings, a provider of drone-delivered chicken sandwiches that’s since pivoted into general food delivery – and examined some of the most common financing terms entrepreneurs and VC investors discuss. In the first installment, we looked at the basics of SAFE notes and how they convert to equity with terms like discounts and valuation caps. Then, in the second installment, we saw how VC investors use pro rata terms to maintain their proportional ownership in a startup. In the third, we learned what happens when growth markers aren’t hit, and saw how full ratchet and broad-based anti-dilution protections come into play when a company raises a down round. It is now time to get our fictitious investors a liquidity event from our little drone startup. Let’s sell our company! There are a number of terms connected to the sale of a startup, and in this section, we’ll explore the two most important ones. By looking at liquidation preferences and seniority structures, we get an understanding of how much money a shareholder is entitled to and when they’re able to get it. As we’ve mentioned in earlier installments of this series, startup investors receive so-called “preferred” stock, whereas employees and founders receive common stock. Preferred shares can carry a number of rights and privileges to which mere commoners aren’t entitled – like anti-dilution protections, voting rights, and claims to board seats, among many others – but perhaps most important to the discussion of liquidity events, preferred shareholders can receive what are known as “participation rights.” Terms like “participating preferred stock” and “non-participating preferred stock” refer to whether investors receive these rights, and we’ll get into what these terms mean here. In short, participating preferred shareholders are entitled to receive their initial investment, plus a pro rata share of the remaining capital in a liquidation event. Here’s a simple example to illustrate this. Let’s say we have a company, Acme Inc., and it has received $20 million in investment for participating preferred shares, representing 20 percent of the company’s capital structure on an as-converted basis. (Common shareholders account for the remaining 80 percent.) Acme Inc. is later sold to another company for $80 million in cash. Those participating preferred shareholders not only recoup their $20 million, but they’d also be entitled to 20 percent of the leftover proceeds of the sale, an additional $12 million in this case. (20% * ($80 million from the acquisition – $20 million already returned to participating preferred shareholders)) So participating preferred shareholders in Acme Inc. would get a total of $32 million back, leaving just $48 million for common shareholders. This is why participating preferred shareholders are sometimes accused of double dipping, precisely because they take two slices of the capital pie. It’s important to note that there are a few clauses that can serve to limit the financial impact of participating preferred shareholders, such as capping the amount of money they can take from the remaining proceeds. In the previous example, had Acme Inc’s investor been a non-participating preferred shareholder with a 1x preference, they’d be entitled to either the $20 million they invested, or 20 percent of the $80 million sale ($16 million in all). In this case, they would take their $20 million back, leaving $60 million to be distributed to Acme Inc.’s founders and employees. In these two contrasting examples, it’s easy to see why non-participating preferred stock arrangements are more favorable to startup founders and employees; it leaves more money on the table for them. That’s why issuing non-participating preferred stock is the standard practice for most technology startups. According to the most recent quarterly report on venture deal terms from Cooley, a major Silicon Valley law firm, over 80 percent of the VC deals struck in Q2 2017 had no participation rights attached. However, what holds true for technology doesn’t hold true for startups in other sectors. Most notably, participating shares are standard-issue in life science venture capital deals, a topic discussed at length by Atlas Venture partner Bruce Booth in 2011. Crunchbase News confirmed that this is still the case with a current life sciences investor. There’s one last question that’s important to address here: what happens if the proceeds from liquidation don’t cover the preferences investors are entitled to? To refer to our examples above, what if Acme Inc. sold for less than $20 million, which would mean non-participating shareholders wouldn’t be covered? Or, for those double-dipping participating shareholders, what if the company sold for less than $32 million? In both of these cases, shareholders would convert their shares to common stock. They would then receive a proportional share of the proceeds alongside other common stockholders. Besides liquidation preferences, the other term that has the greatest bearing on the liquidation process is seniority. Basically, it describes a stakeholder’s position in the line to get their money back. The closer to the front of the line you are, the more likely you’ll be able to get what’s owed to you in the event of the sale or bankruptcy of a company. In the “big picture,” creditors are senior to shareholders, meaning that the company will first have to repay its debts before its shareholders can cash out. Within each type of stakeholder – again, creditors and shareholders – there can be many different tiers, but here we’ll focus just on the seniority structure of shareholders. One of the other privileges given to preferred shares is seniority to common shareholders, so in the event of an acquisition or bankruptcy, preferred shareholders – the investors – get access to proceeds from that liquidation event before common shareholders (founders, employees, and service providers to the company). But not all preferred shareholders are necessarily created equal. Depending on the seniority structure, some investors are closer to the front of the line than others. The two most common seniority structures are the “standard” approach, and what’s known as pari passu. Let’s take a look under the hood, shall we? In the standard approach, seniority is ranked in a sort of reverse chronological order. It’s a “last in, first out” situation. 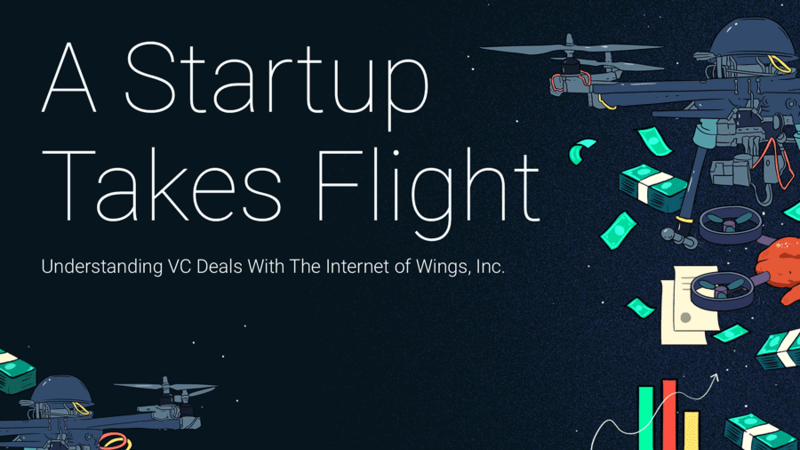 Investors in the most recent round – in the case of Internet of Wings Inc., it’d be the series C preferred shareholders – are the first in line to receive their payouts, whereas investors from earlier rounds will have to wait their turn. This can lead to a situation where, if the company was liquidated for a very small amount of money, earlier investors, and common stockholders, get nothing. But that’s how it works. Lee Buchheit, a legal expert specializing in debt crises, describes the pari passu clause as “charming.” The term, according to Buchheit, is “short, obscure, and sports a bit of Latin; all characteristics that lawyers find endearing.” Translated literally, it means “with an equal step,” and in the case of financial seniority, it basically means that there is no seniority. For preferred shareholders, it means there is no orderly queue, which may sound like a bad thing. 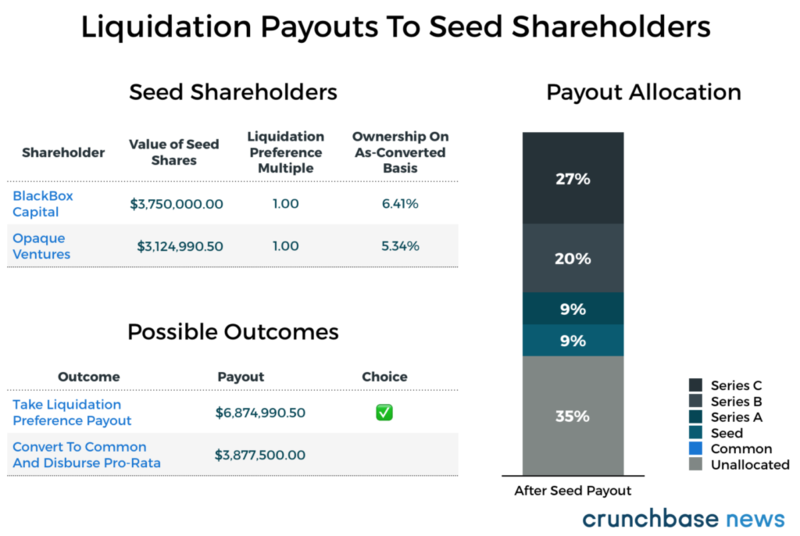 But it allows all involved investors to gulp down their liquidation preference payments at once, with Seed preferred shareholders getting the same access to a payout as Series D investors. As an aside, these are not the only two ways to structure financial seniority. There’s also a hybrid approach where investors are put into different tiers of seniority but, within each tier, liquidation preference payments are distributed pari passu. And before we see how these terms affect how money is returned to shareholders, let’s quickly check in on our company. It’s been a little over a year since Jill and Jack raised a down round at Series C to keep funding their enterprise. Despite a somewhat rocky start and a thin budget, the duo and their team managed to turn what was a failing business into, well, not exactly a raging success. However, it was something they didn’t feel shame about. After all, their struggles had been loud and public. To that end, they worked tirelessly to make their drones quieter. After all, it was the noise that scared most of their customers, consisting mostly small restaurant owners looking for a better, faster delivery method, away. It turns out that Jill’s earlier idea of using feathers to reduce noise wasn’t so cockamamy after all. After consulting with a food safety expert, though, they realized that using actual feathers would get them into even more hot water with the government. It took over a year to settle the case with the FAA after the steak tartare incident at LAX. “You mentioned bio-mimicked material before. Owls have these super fluffy feathers on their, uh, undercarriage that help them stay deadly silent. I have an ornithologist friend who moonlights as a material scientist. We could get him to develop some proprietary fluff for us.” Jack offered. After months of tweaking and testing, this improbable combination of bird scientist and polymers aficionado had developed a material that was uniquely suited to the task of reducing the drone of the drones. It had the added benefit of making the engine housings appear to be covered in thick white down, which went a surprisingly long way toward relieving customer anxiety over sharp, whirling propellers. Meanwhile, the little drone startup that could had caught the eye of a corporate development executive at Sahara, and she kept that eye on our startup for the past several quarters. We all know Sahara, the online shopping conglomerate that’s metastasized into other industries ranging from infrastructure and abortive attempts at phones, to grocery and food delivery. Its founder desired to build an ecosystem wider and deeper than any rainforest, aspiring to offer more products and services than there are grains of sand in the wide, desolate expanse of north Africa. And, for most intents and purposes, that’s what Sahara has achieved. But like the slow, creeping spread of the real Sahara desert, the company managed to keep adding more products and services. And the next one was drone delivery. The Sahara executive was intrigued by the team and the Internet of Wings’s adoption by real, brick and mortar businesses. Indeed, it was brick and mortar businesses that the company had successfully competed against for years, so much so that restaurants, coffee shops, bars, and other foodservice businesses seem to be the only ones left. But it was that market – restaurant delivery in particular – in which Sahara had not yet found a toehold. The Internet of Wings, she thought, would be that foot in the door. Sahara’s offer – $75 million to buy IoW’s business, the drones, intellectual property, and the services of its team for the next three years – was not the first acquisition offer Jack and Jill had received, but it was the best. And considering that they’d raised a Series C round explicitly to fund the company as it found a final resting place, taking the offer was aligned with their original plan. Put to the board in a hastily-called meeting, the decision to accept Sahara’s offer was approved. Internet of Wings Inc.’s board decided to accept Sahara’s offer to buy the entire company for $75 million in an all-cash deal. As is common practice in tech startups, investors’ preferred shares were non-participating. Seniority is standard (last in, first out). All outstanding options will convert to common stock during the liquidity event. 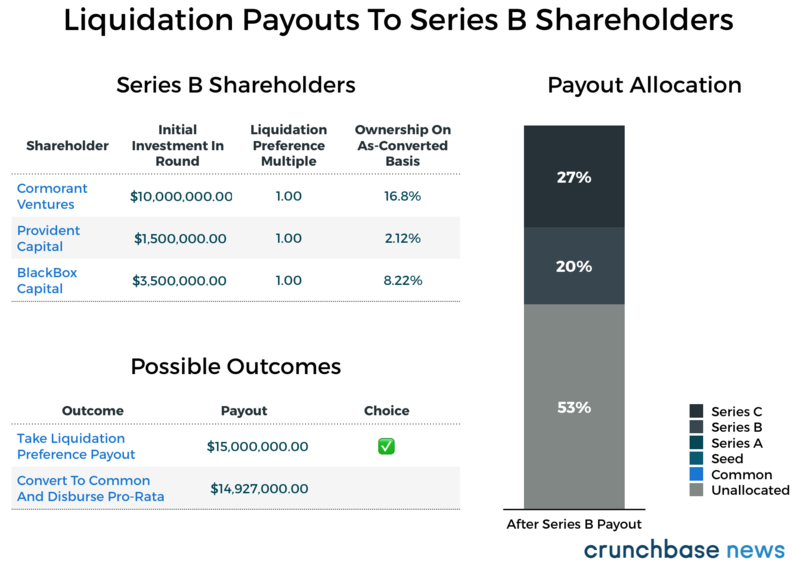 From the Seed round through Series B, investors had a 1x liquidation preference, but due to the adverse conditions the company had experienced leading up to its Series C round, investors in the Series C round received a 2x liquidation preference. We’re assuming the company has zero debt and no dividend rights. We’re going to make this as vanilla as possible. To illustrate the process more clearly, we’re going to show how each investor decides how they approach the choice between taking their liquidation preference payment or converting to common stock and redeeming their proportional share of the proceeds available to investors in their seniority level. And for each seniority level, we’ll plot how much of the $75 million acquisition they received. We start with the most senior investors. Since Internet of Wings’s most recent financing round was a Series C, shareholders of Series C stock are most senior. 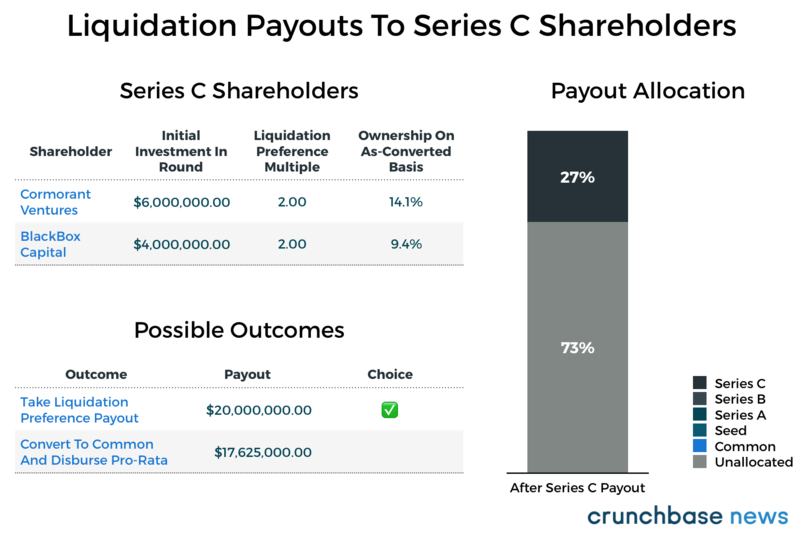 In this case, because series C shareholders attached a 2x multiple to their liquidation preference, they will get more money by taking the liquidation preference payout than by converting to common shares. 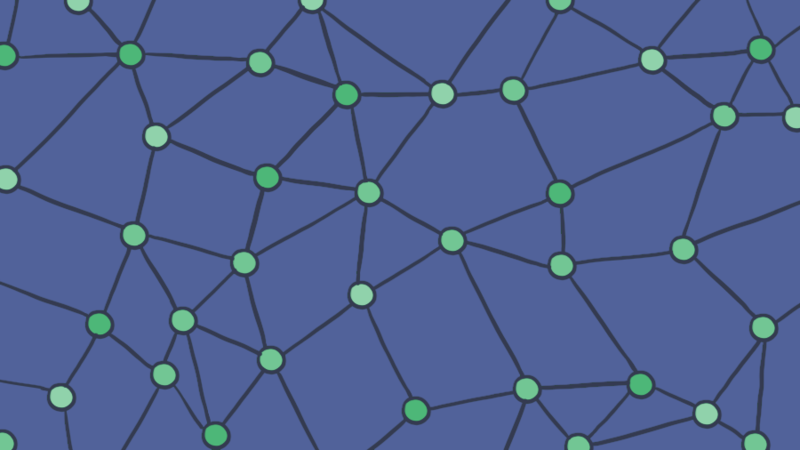 Cormorant Ventures receives $12 million (twice its investment in the round) and BlackBox Capital receives $8 million (again, twice its investment in IoW’s Series C round). 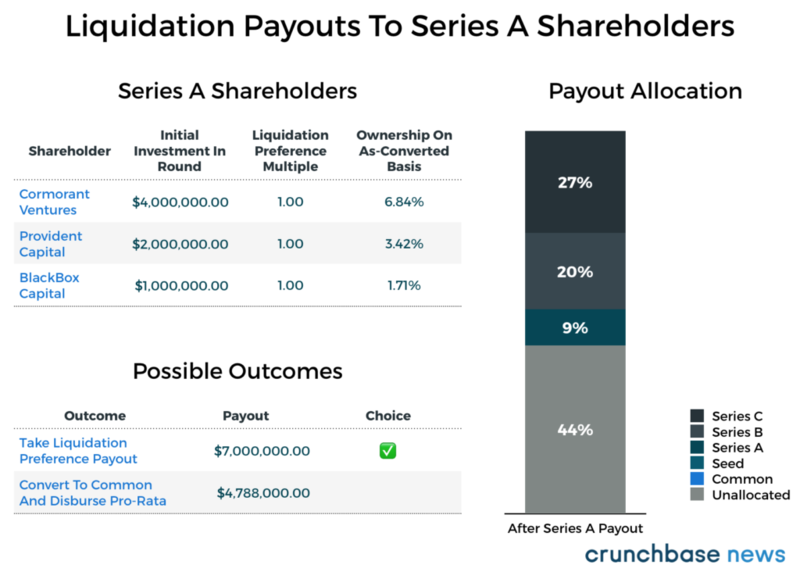 Series B and earlier shareholders only have a 1x multiple on their liquidation preferences, and we’ll see how that affects decision-making. 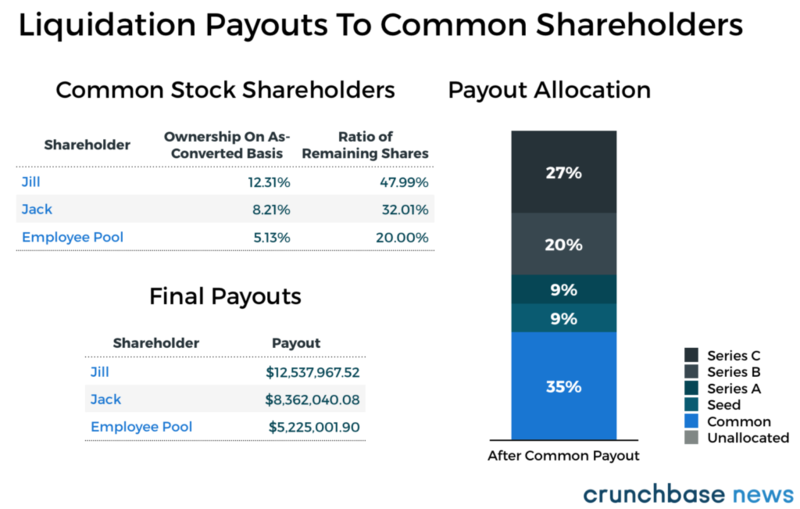 In this case, it makes more sense for the Series B shareholders to simply take back their initial investment, rather than converting to common common shares, and we’ll notice that this is a pattern. Cormorant Ventures collects its $10 million; Provident Capital takes its $1.5 million, and BlackBox Capital receives its $3.5 million. At this point, almost half of the $75 million paid out in the acquisition has now been accounted for. Moving down the seniority ranks, we now have our Series A shareholders, which also have a 1x multiple on their liquidation preference. Here too it makes more sense for investors to take back their initial investments according to their liquidation preferences. It’s in the case of the two participants in the seed round that things get marginally more interesting, but – spoiler alert – it will still make more sense for them to take back their initial investments. 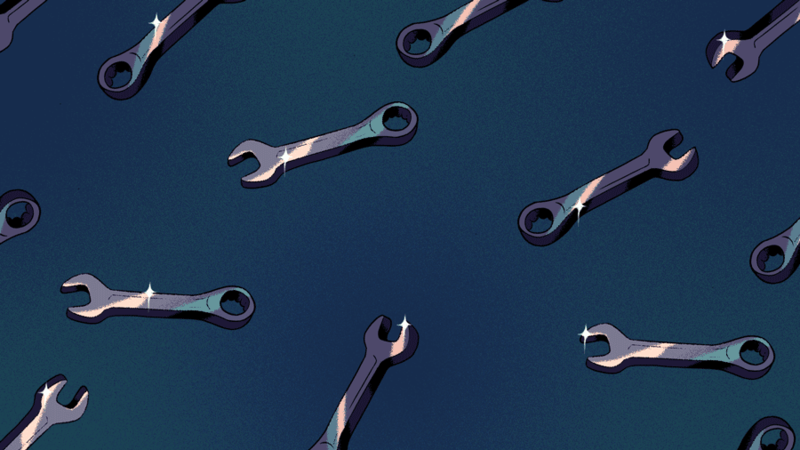 Here’s why it’s interesting: both investors in the seed round committed $2.5 million, and as we showed in the first installment of this series, the terms of a seed deal matter quite a bit. BlackBox Capital opted to go with a valuation cap, while Opaque Ventures were able to buy shares at a 20 percent discount. Because of IoW’s series A valuation and how that round closed, BlackBox came out ahead in the round, both financially and in terms of proportional ownership of the company. So what is left? As it turns out, quite a bit. After all of the preferred shareholders cashed out, common stockholders get whatever is left. Despite all of the trials and tribulations of getting the company started, it looks like it was all ultimately worth it, at least for our founders. Here, as the last recipients of proceeds from the acquisition, final payouts are determined based on ownership ratios in the company. Since Jill holds approximately 48 percent of the remaining stock, she gets that share of the heretofore unallocated $26,125,009.50. Jack, holding roughly 32 percent of the remaining stock, gets 32 percent of the remaining proceeds. And employees receive a collective bonus of 20 percent of the remaining capital. One of the most common measures of performance in the VC space is also one of the simplest. Calculating the multiple on invested capital (MOIC) is as easy as dividing the amount of money received after the company winds up by the total amount of money invested. So, as we can see here, Internet of Wings Inc. was not a home run. Silicon Valley investors talk a lot about finding the companies which will deliver a 10x return on the capital they invested, and IoW didn’t achieve that for its shareholders. Although “price matters” may sound like the most painfully obvious statement ever, price really does matter, but not for an immediately obvious reason. Remember that preferred shareholders carry the option to convert their shares to common stock and receive their proportional share of the payout. That conversion threshold – the proceeds from a liquidation that would make common shares more valuable than simply the liquidation preference payout – is different for each set of shareholders, and it depends on the terms of the deal. In the case of Internet of Wings, for every single investor to convert to common shares, the company would have to sell for about $118 million. Series C – $73 million. Series B – $104 million. Series A – $117 million. Obviously, every deal is different, but the principles remain the same. Professional investors are in the business of generating returns for their limited partners. It’s difficult to predict how an investment is going to work out until it works itself out. But as we’ve shown here, that working-out process doesn’t need to be difficult. It’s just a series of rational decisions based on what will generate the highest return on investment. We looked at the effect liquidation preference multiples have on investor decision-making and how a standard seniority structure works during an acquisition. And, we’ve learned the all-important nature of price, both to returns, and to investor decision-making. Throughout this series, we’ve shown that the mechanics of startup finance are not that confusing or opaque. Although we used deliberately simple examples, the “real world” isn’t that much more complex. Of course, there are way more legal terms than the ones we’ve discussed throughout the series, but we selected terms like liquidation preferences and pro rata because they have the greatest bearing on the financial outcome of a company. For all the other covenants, clauses, and contractual agreements, find a good lawyer and get venturing.